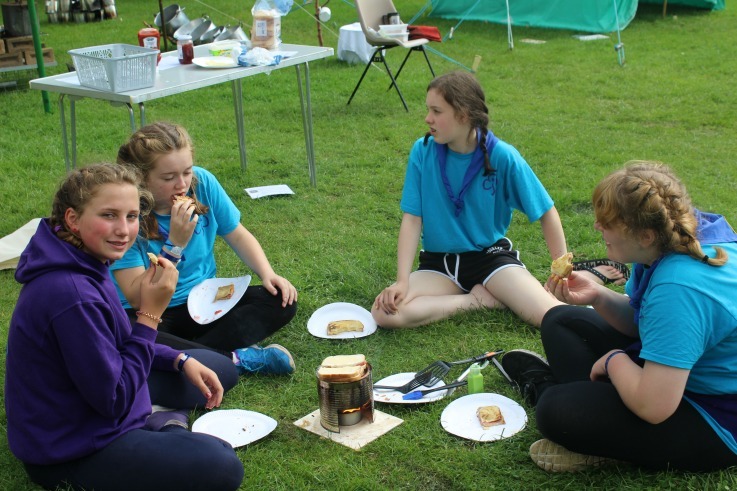 One of our most popular activities in the 100 zone at #WAVES2017 was the chance to cook over buddy burners, and we promised to share the instructions for those groups wishing to try it for themselves. 1. With tin snips, cut door in the larger tin on open end – this needs to be just a little larger than the tuna tin. 2. Either use the drill or the church key tin opener to make vent holes around the top of the larger tin. Make about 8 holes with diameters of 6-8 mm. 3. Spiral cardboard strips around one wick and squeeze into tuna tin – the coils need to fit snuggly but not too tight a fit. Tuck in the two other wicks between the coils– always good to have spares to light if one goes out! 4. Carefully fill the tuna tin with melted wax allowing it to fill the spaces between the card. 5. After the wax has set you can store your buddy burner until you are ready to use it. 1. Only use outside and stand the burner on a heat resistant surface; it gets VERY HOT. 3. Light the wick[s] and wait a while until the card & wax catch alight. 4. Place the large tin over the small tin, you can begin to cook once the larger tin heats up. Remember its surface is not like our non-stick pans so use plenty of cooking oil. 5. To extinguish: Using tongs, I invert the larger tin and use the cooking surface to press down on the burner to smother the flames – do not use water. Make sure it is fully extinguished before moving and remember there may still be hot, liquid wax in the burner. Do not take inside until you are certain the fire is completely out; I recommend leaving the extinguished burner outside overnight. either place onto the larger tin or construct a suitable frame to hold it over the burner.